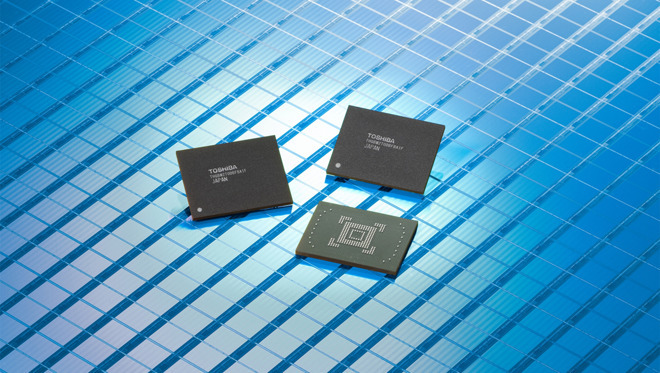 Toshiba has received approval from the Chinese government to sell a majority stake of its chip unit, in a move that could affect dealings for the NAND flash memory used in iPhones and other Apple devices. Some 128-gigabyte Toshiba NAND chips. With China's vetting, Toshiba said it has received "all required antitrust approvals," the New York Times reported on Thursday. Taking control of the chip unit is a consortium led by a U.S. investment firm, Bain Capital. A sale agreement was actually reached in September, but Toshiba has been waiting for months for get China's approval. The Chinese government was allegedly concerned that one partner in the Bain consortium, South Korea's SK Hynix, might end up with a significant stake and narrow competition in the memory market. Toshiba is hoping to use the influx of money — about $14 billion — to recover from the bankruptcy of its U.S. nuclear division, Westinghouse. The company was courted by a number of potential buyers, among them a consortium including Western Digital and Apple assembly partner Foxconn. Due to existing holdings and agreements, Western Digital tried to halt any sale without its approval, only reaching a settlement with Toshiba in December. Apple has been reported as being part of the Bain consortium, along with parties like PC maker Dell. At one point Apple was said to be ready to spend as much as $3 billion. Toshiba didn't confirm Apple's involvement on Thursday. Participation might make sense though, since the former is one of the world's biggest memory suppliers, and an Apple investment could ensure a constant flow of memory and prevent production bottlenecks.